If you want to escape from civilization, look no further. Valley of the Gods, mere 40 miles north-east of the world-famous, tourist-infested Monument Valley, has no crowds, no cell-phone or radio reception, no paved roads, no restrooms and/or any other facilities, yet by many it's considered to be more spectacular than its aforementioned famous cousin. We spent two hours there and saw only one other car somewhere in distance. 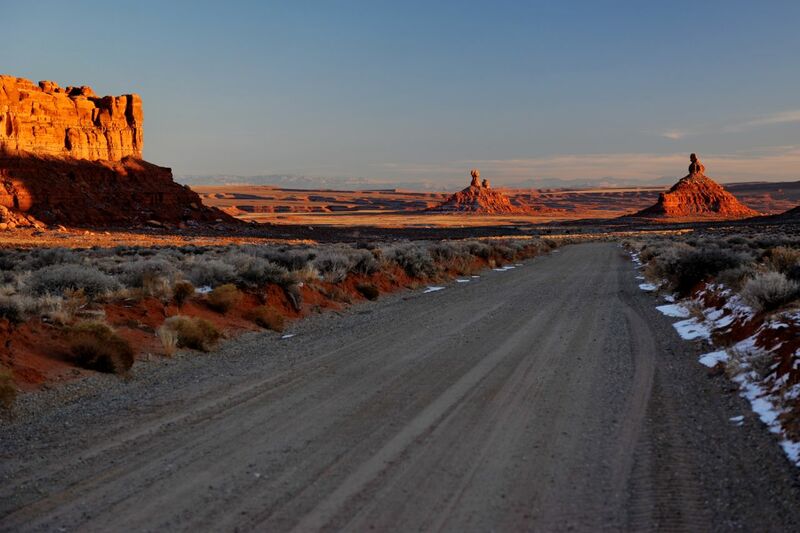 What a stark contrast to Monument Valley, where you see at least five cars at each single viewpoint or turn of the road. 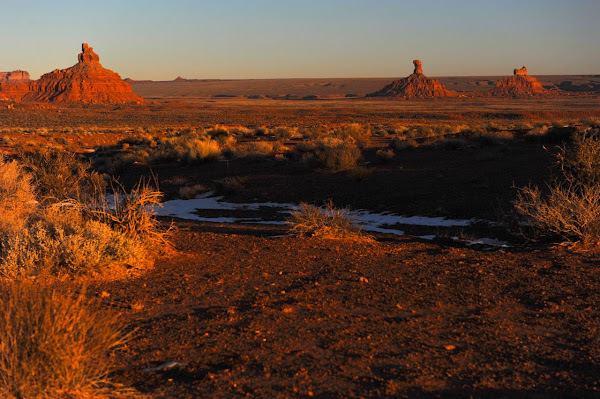 Additionally, there is no fee to enter Valley of Gods, and you're welcome to do there whatever pleases you: you can camp there (again for free), go hiking anywhere you want, or even do some bouldering/rope climbing. Valley of the Gods is yours to play with. Similar to Monument Valley, the most prominent rocks in the Valley of the Gods have names. 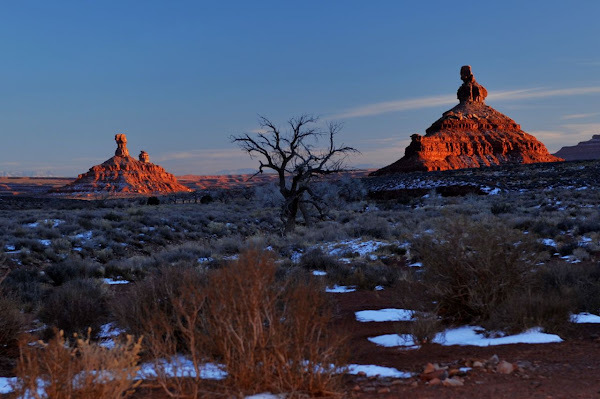 These names are typically meant to describe what the rock formation resembles, so for example in the Valley of the Gods you can Setting Hen Butte, Lady in the Tub, Battleship and Seven Sailors. It's actually lots of fun to try to look for those shapes in the rocks. There's only one road leading through the park: a bumpy 17-mile-long dirt and gravel road with many steep sections and sharp turns. As I'm a road, not destination, kind of person, I had lots of fun driving there and I loved that each bend in the road hold a surprise: a new rock formation or a new scenery. 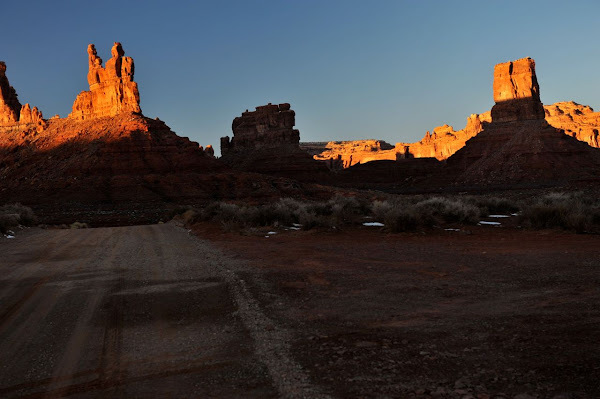 The best time to visit the Valley of the Gods is in late afternoon, when the sun is low and the rocks glow in beautiful warm red color. Sunset is a great time too, as it emphasizes the ruggedness of the landscape.